I sometimes wonder if Caritas president, Cardinal Luis Tagle (Chito to his friends), is the most ‘selfied’ Cardinal on the planet. Wherever he goes swarms of people surround him asking for selfies and he kindly accepts. I’m not sure how comfortable he is with all this attention, but it seemed only appropriate that when we gathered #YoungCaritas for a talk with him in the krakow suburbs during World Youth Day we got a Caritas selfie (see above). 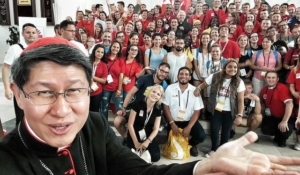 Cardinal Tagle and young people who work for Caritas in El Salvador, Venezuela, Senegal, New Zealand, Canada, Luxembourg, England & Wales and of course Poland, came with us to a church in the neighbourhood of Bieńczyce to celebrate Caritas youth. They did this by telling pilgrims about Caritas’ work and what it means to be Caritas, and inspiring them to join us in our work. One by one young Caritas representatives came to the podium and told the pilgrims about their experiences of being at the heart of Caritas. Joe Moaono-Kolio from Caritas Aotearoa New Zealand described how they travel from island to island in the South Pacific to help communities fight climate change. Noe Flores told the audience about the relentless violence in his country of El Salvador and how, through Caritas, he goes into communities to help them heal relationships, gain justice and build bridges towards peace. Rose Sagna from Caritas Senegal spoke of their programmes to help migrant women who leave their poverty-stricken families in the countryside to find work in the city. With Caritas Senegal’s help, they start small businesses so that they can boost family incomes. Annie Romero of Caritas Venezuela told the pilgrims about the serious social difficulties in her country at the moment and how Caritas works with communities to face them. Rebecca Rathbone gave examples of how Development and Peace/Caritas Canada uses fun and interactive activities for young people to learn about social and environmental justice issues and about how to take action against injustices. She said young people “have great ideas now, they have amazing energy and talents now, and so they should be heard now – not later. Daniel Hale from CAFOD (Caritas England and Wales) reminded us all how we each have enormous potential to speak out against injustices on behalf of the poor and become activists who use our access to decision-makers and media to fight against the ‘globalisation of indifference’. Cardinal Tagle spoke of Fr Jacques Hammel, the French priest who was killed while celebrating Mass in France the day before, in his speech at the beginning of the gathering,. He said, “You cannot imagine a priest celebrating Mass and two people just coming into the church and just killing him. We had the answer in the church where we were gathered and in the work of Caritas organisations around the world. Following an interview with a Polish journalist, the Cardinal burst into this song from the 1968 film about about Oliver Twist and my colleague Alfonso joined in as a group of us looked on agog. Priceless WYD moment. I’ll leave you with the words of Martyna Fibich, an 18-year-old volunteer for Caritas Poland. She’d been volunteering with Caritas for (incredibly, considering her age) 6 years. She took to the podium with her boyfriend Mikołaj Szularz, who she’d met while volunteering.